So do we think Joe Mixon and Boyd lost a ton of value now? 9-3. 9 W’s down. 4 to go! Back in sole possesion of first too. One win from the last two to guarantee the paloffs. To @Chew point, I presume you’re referring to our 0-12 ‘friend?’ He more ir less sacked it off from the get go. It’s been weeks now he’s been players down. I hate to propose it on an original longstanding player in our league but I wouldn’t invite him back next year unless theres a guarantee to see it through. In the interests of fairness. The same with everyone. ...in the playoffs! You're going down, Sassenach! A fading Wentz vs the Skins or Jameis Winston vs the Panthers? Have Wentz...but his play the past two weeks has been awful. Winston would require dropping a player (maybe AP or Josh Adams/Josh Reynolds). The hardest part about this league is knowing who's coming back, and knowing who doesn't want to. No one checks their emails. Probably will have to nuke that win-less team though. I can't even tell who they are. Well it is that time of year when you bang your head against the wall because you just need one guy to lose this weekend to make a miraculous comeback and make the playoffs but his opponent is starting Bortles, TJ Howard and D Jackson this week (he hasn't bothered to set a line-up in 3 weeks). In lieu of the Kareem Hunt video dropping..Spencer Ware is a must add I'd think. I missed him by 10 minutes. Doh. I had Ware on my team cuz I have Hunt, but cut him a few weeks ago for someone I forget who. Now I'm stuck with White, Coleman, Peterson, and Edwards. Hunt why did you do this?! I'm in first place by the way. If I lose because of this incident I'll be pissed. Missed Ware in all 3 leagues I was in. Man did people react quickly on that one. Normally one of my leagues is all over stuff like this, but the other 2 I can sneak and grab the guy who just got a huge bump. Not this night. Three Amigos of Boom-Or-Bust TEs who tend to err more on bust. 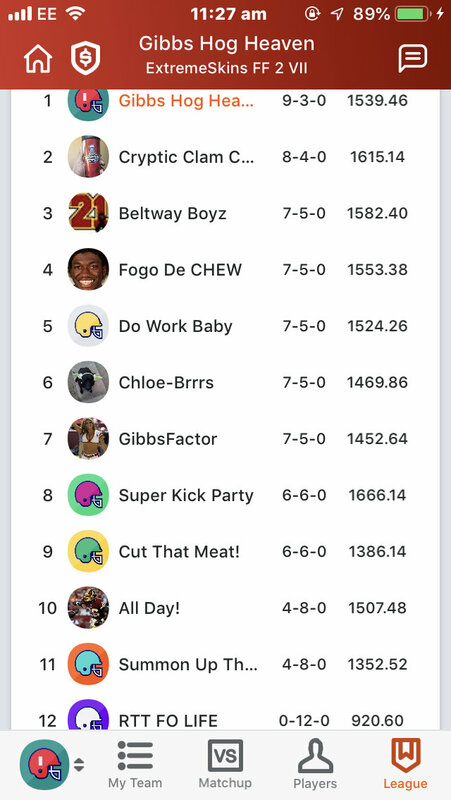 Even if I manage to win my match-up and squeek into the playoffs, I don't think I'd make it out of the first round. I wonder if one of the Williams would make sense as a stash. Ware hasn't been reliably healthy before..of course they might just run more Hill or other WR sweeps. Ware has had opportunities before, but KC hasn't really given him the full workload in the past. Seems like they always want to mix someone else in with him. Their offense is a different beast this year though. I missed grabbing him too. Oh well. Anyone need any FFL advice going into the playoffs from me? I'm obviously very good at it. missed ware by 20 min, but was able to pick up ekeler on WW with the 9th position. Assuming it's 1pt ppr..I like Ekeler, Mack at RB and go with 3wrs. I'd choose Evans, Hill, and Cooks. Kicker and defense needs to be removed from all fantasy football. Just a luck based joke. Every year it ruins my games. Hah. Belichick ran one extra pointless play at the end of the first half. Pointless unless you had James White who got a 42 yard catch out of it, which helps his fantasy stats. Good lord. Patrick Mahomes at 4,000 career passing yards in 13 games. I think Kurt Warner got there in 15 games. 9-3 and I'm going be bounced immediately. Fantasy football playoffs are such a crap shoot. Yes they are. You can consistently get to the playoffs, but beyond that is pretty luck based. I have no idea if this is accurate or not because I'm not playing there, but I saw a tweet that said Jaylens Samuels is listed as a TE on Yahoo. If Conner is hurt, that could be something to capitalize on at TE for at least a week maybe, if it stays that way. If I'm doing the math right, I need a little less than 3 points tonight from Wentz to make the playoffs. Or I need him to outscore Jordan Reed by 4 points. As bad as he's played, if Wentz can't get 15+ against this bendable D, then I don't deserve the playoffs. Yep he's listed as a TE/RB in Yahoo so that's even better! Shades of Marques Colstons TE/WR designation in his first year. Well need McCoy (2 QB league) and Reed to outscore Agholar and Ertz by 7 points to make the playoffs in one league. (This is a league where I was concerned that a 3-8 team wasn't going to set a viable line-up but he did and he won giving me an opening).